I grew up listening to Casey Kasem’s weekly radio broadcast of “America’s Top 40,” even after my musical taste evolved and I began to broaden my horizons by listening to music by artists that did not often top or even enter the charts—usually the music was labeled “alternative” and could be found on radio stations on the left of the dial. The show aired on Sunday mornings where I grew up and I remember bringing my transistor radio—it was hot pink and fabulous—with me to the beach to listen during the summer months. Kasem ended each broadcast with this message for listeners: “Keep your feet on the ground and keep reaching for the stars.” I loved that. 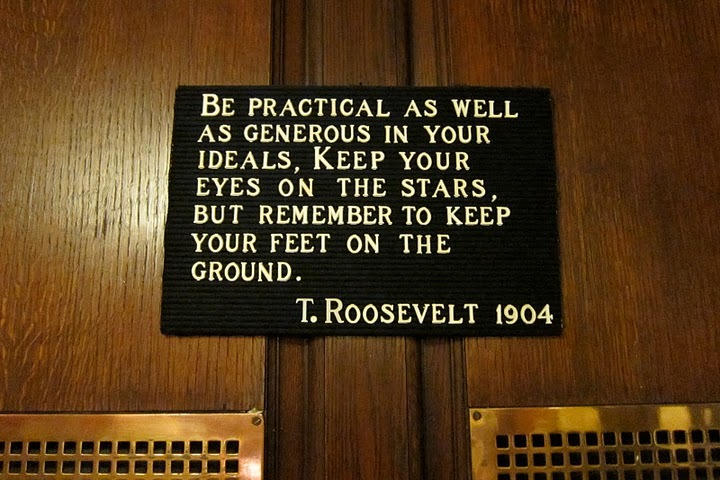 During a recent visit to Teddy Roosevelt’s childhood home in NY, I found the quote that must have been his inspiration (pictured above). And here’s the song that popped into my head when I began to write this post: “Left of the Dial” by the Replacements.